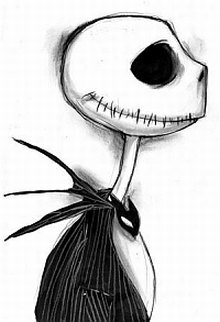 It’s been interesting to watch, over the past ten years or so, the cultural ascent of Tim Burton and Danny Elfman’s holiday mashup spectacular The Nightmare Before Christmas. When the movie came out in 1993, I was a young lad of 13, and went and saw it with my dad. I had seen some ads for it, and for some reason, I was drawn to it, a bit too old, perhaps, for animated movies, but really excited to see this one, nonetheless. I can still remember sitting in the theatre and absolutely loving it – when I left, all I could think about was going and buying the CD. I vividly remember the exact moment that the switch got tripped; it was during a sequence near the end of the film, when Jack sets off on his sleigh to be Sandy Claws, and this charging, soaring music kicks in, that my ears said to me, “You must have this soundtrack.” I didn’t know why, exactly, but the music resonated with me in this really profound way; the blend of epic, soaring melodies, flying woodwinds, and evil, deviant mallets and polka beats… I did not, at the time, know the name Danny Elfman, but I did know that I loved the music from Batman, Edward Scissorhands, and Beetlejuice.